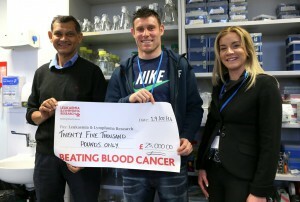 The James Milner Foundation has supported Leukaemia & Lymphoma Research since the Foundation’s inception in April 2012. James and Amy visited the laboratories at The University of Manchester just before the end of the 2013/14 season to see how the Foundation’s support was having an impact on life-saving research study into childhood leukaemia. Survival rates for the most common form of childhood cancer, acute lymphoblastic leukaemia, are now over 90%, but those children who relapse after treatment have a poor outlook. The project, funded by blood cancer charity Leukaemia & Lymphoma Research, is developing testing to identify those children who are likely to be resistant to chemotherapy. The scientists are also looking for alternative ways to treat these patients. James, Amy and Trustees from the Foundation toured the laboratory, which is part of The University of Manchester’s Institute of Cancer Sciences, and spoke to Professor Vaskar Saha, who is leading the project.